What a Day! As we launched the rain & wind started. By about 10:30 the rain & wind stopped, the sun came out and calm waters arrived. Most fished the weed lines and breaks. Some ventured in closer to shore. But at weigh in Jeff & Eric came in with the winning bag, 14.24lbs!! Texas rigged worms & grubs were their ticket. Congrats to Jeff & Eric! 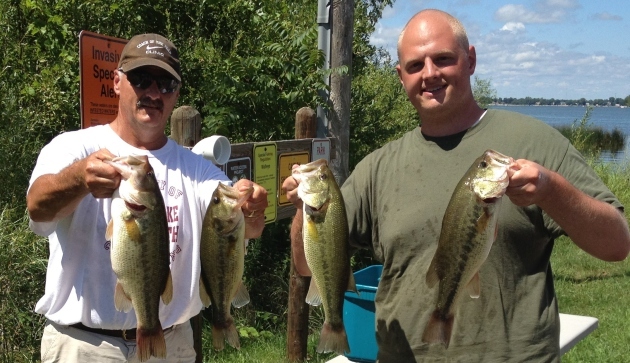 Also congrats to Wayne & Adam with the Big Fish weighing 3.86lbs.Senkos, hollow frogs, jig worms & drop shot also worked. With three events left, the race for AOY is tight! Will the Wilson Clan keep ahead or will another angler emerge? Next stop is the Mississippi in August!